Interactive drawing tools allow users to design projects. Storm water runoff from Washington, DC, carries contaminants such as tar, mercury, and herbicides downstream to nearby Chesapeake Bay, the nation’s largest estuary. 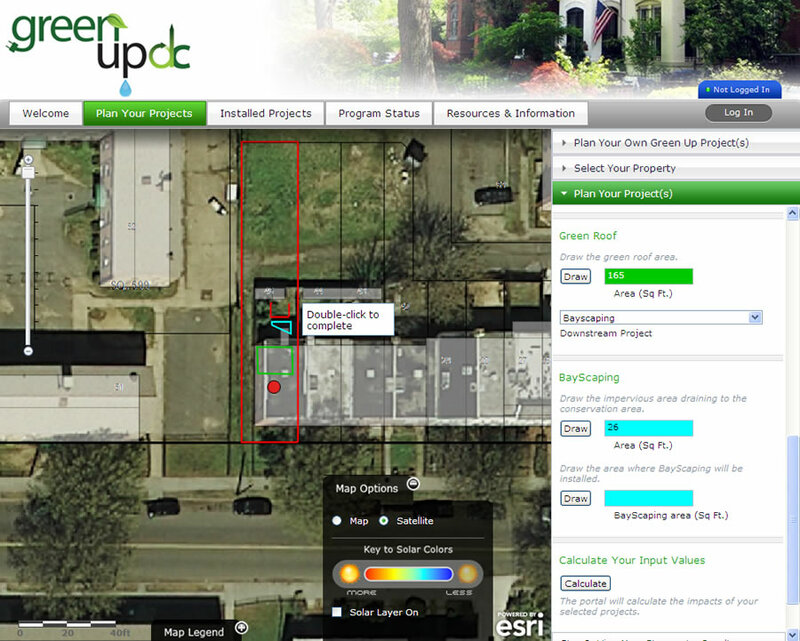 Area residents can take an active role in protecting the bay’s health, and lower their utility bills, by using a new interactive web mapping application, Green Up DC, provided by the District Department of the Environment (DDOE). 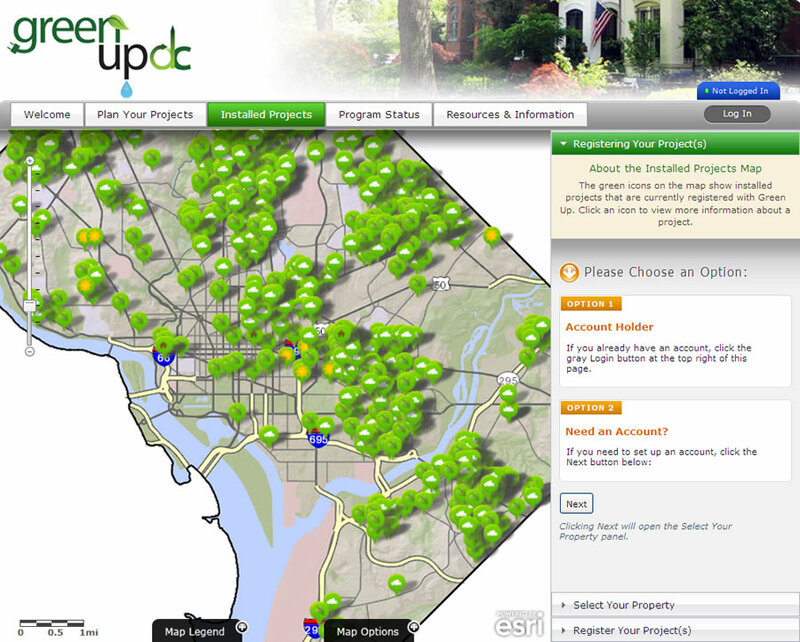 Green Up DC offers Washington, D.C. residents tools to plan new improvement projects for their homes and businesses, such as green roofs, pervious pavement, and rain barrels. They also can access information about financial subsidies and rebates, register installed projects, and view maps of other property owners’ projects. Status dashboards display high-level program metrics or key performance indicators (KPIs). Critigen, a technology consulting and IT outsourcing company, uses location data, business intelligence tools, and cloud computing in its work with public and private clients. Taylor and his team worked with DDOE to design Green Up DC, which is based partly on eco-portals built for other clients. With its partner CH2M HILL, Critigen adapted a storm water runoff model developed by the Center for Watershed Protection so it could be easily used by people who have no technical background. Critigen used land-base data, aerial photographs, and impervious surface information from the district’s ArcGIS for Server map services to display property characteristics and provide input data for the calculators. Existing projects are mapped so users can identify other projects installed in the neighborhood. 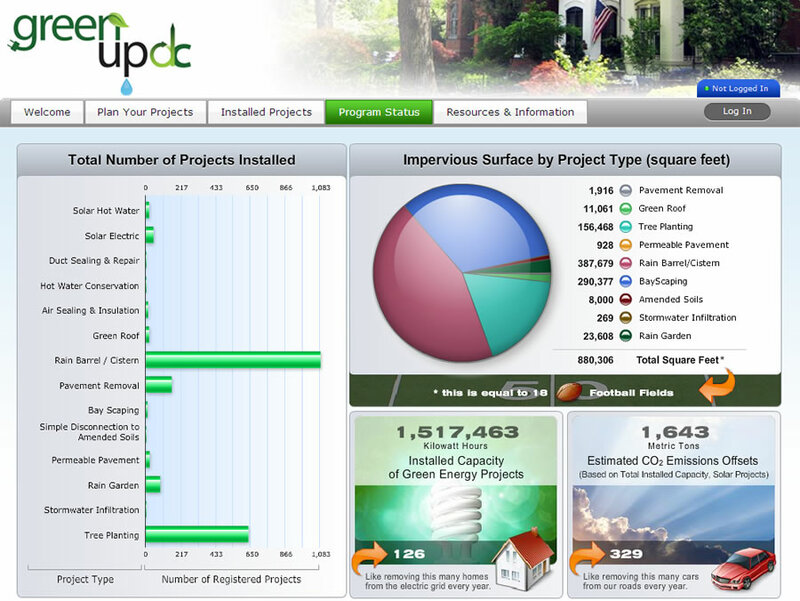 Green Up DC maps both planned and registered projects and provides a program status dashboard and reports that can be used to monitor the progress of the program. Homeowners and business owners can access the status dashboard to see the anticipated impact of a particular project. DDOE officials will be able to verify how many projects are completed and add the data to reports for the city as well as the Environmental Protection Agency. The reports include summaries listed by specific watershed, sewer shed, or political jurisdiction. For more information, contact Jenny Guillaume, environmental protection specialist, district department of environment.